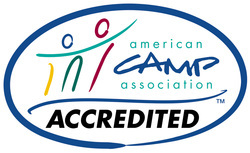 The Holston Conference Camps follow the accreditation guidelines set by the American Camp Association. This means we operate by the highest standards of the camping industry. We do this in order to insure that our campers and guests receive a safe and quality experience when participating in any of the ministries of Camp Bays Mountain, Camp Dickenson, Camp in the Community, Camp Lookout, and Camp Wesley Woods.